When you visit our Reno dental practice, you’ll find a relaxing office decorated in earth tones, with a warm and friendly staff to greet you. 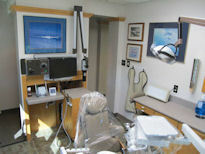 Our advanced technology helps our dentists deliver treatments that are highly effective while providing maximum comfort. Our team values your time so you can count on being seen promptly, while our staff is eager to answer any questions you may have about our services, scheduling, or your insurance. CEREC’s CAD/CAM digital design and milling system allows our dentists to obtain digital impressions and fabricate restorations like crowns and bridges in one visit. This makes tooth replacement and repair fast and easy without sacrificing quality. Having a combined 40 years of experience, and gaining an excellent reputation as dentists who produce quality results, gives our patients confidence. Because our patients trust us, they tend to keep their routine appointments. This leads to better oral health and reduces the risk of dental emergencies and other complications. Along with our same-day services, we offer laser-assisted dentistry for gum disease prevention and treatment. Our soft-tissue laser is also used to re-shape high-profile gums and to perform comfortable frenectomies. If you choose to replace missing teeth with dental implants, we are a one-stop shop that can address all your needs. From your initial evaluation to topping the implant with the appropriate restoration, Dr. Gilman does it all. If your jaw has lost bone mass, our dentist can reinforce your jaw bone, making you a good candidate for the procedure. If you are seeking a dental practice that utilizes the latest and best dental techniques and technology, call our office today. Our dedicated staff is happy to answer any questions or schedule a convenient appointment time for your first visit.